Exploding Doughnut: "One is the loneliest number"
Watercolor with gouache on watercolor paper - 5" x 7"
I finished this one over the weekend. I'm pleased to report that I really like the way this painting turned out. Normally I use an overhead light for my still lifes, literally pointing down on the subject(s). This time around I used just one light source from the side. What a difference! 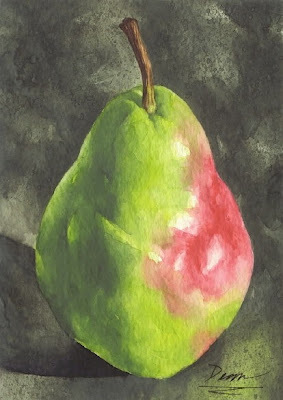 This made the pear look much more dramatic and moody and a lot more fun to paint! I'm definitely going to stick with lighting my subjects this way from now on. So much more interesting to paint this way. I love it. It's a beautiful pear. Your comment isn't too long at all. It's just right! Carol Marine's got some mad talent. I'm not sure I can be compared with her work. My style has a "masculine" approach to it? That's the first time I've ever heard that. Thank you! What a unique comment. Thanks for the compliments on my pear and for stopping by! Very successful painting Dean. I love Pears that have that blush on the side. Of course it's lonely it is a pear(pair)! Light and shadow makes a painting or drawing as far as I am concerned (and that cominb from an abstract artist!). LOL at the apple or orange to cheer it up. The shadow definitely adds interest. Maybe helps show depth? But perhaps occasionally another direction for the light might work, also. Something diagonal — I don't know. I love pears that blush on the side too! That's why I picked this one to paint. I appreciate the suggestions about playing with the direction of the light source. I'll definitely be doing that. Very pleasing colors and beautiful lighting! Wonderful painting. I also love the subtle reflection of pear where your signature is. I'm so glad you noticed the reflection of the pear where I signed the painting. Wasn't sure anyone would catch that! The first thing I did was check to see if my blog still had a pulse. 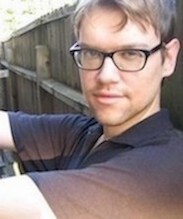 I see a face I don't recognize, leading me to one the most interesting, exciting and eclectics blogs I've visited. You're very talented in so many ways! Thanks for visiting! Wow, it's an honor. You are the "Queen of leaving comments" as far as I'm concerned. You're everywhere! I've seen your face practically on every art blog, commenting on each post. To have you visit mine means a lot. Nice style. Looks very cool. I love this pear! I love how you have that beautiful glow of reflected light on the back of it... so many people don't see and include that important detail! And, you have made the stem look so real. The background is amazing... yet again, a beautiful watercolor (and gouache) painting! Using more dramatic lighting this time around made it hard to forget about the reflected light on the back of the pear. The strong light source helped me a lot. Hi Dean...I like your background ( grey, black). There's a strong contrast between the dark background and the pear...It's a mixed media painting ( watercolor, guache), but so transparent! I like it! I liked the contrast too. It was all in the lighting. I tried to keep a nice balance of opaque and transparent qualities in this still life. Wow - this is wery well done! I really like the smoky background and how the pear is anchored by its shadow. Aren't pears fun to paint?! I forgot to ask what colors you mixed for the background. Thanks for the compliments on my pear. Yes, pears are FUN to paint! Hooray!! I also like the shadow anchoring the pear, if I do say so myself. The colors mixed for the background? Hmmm, it's been a little while but from memory it was Sap Green, Burnt Sienna, a little bit of Black and Phthalo Blue. I believe I added a touch of Alizarin Crimson in there too, to knock the vibrancy of the green down a bit. Quite a compliment coming from you. Your work is so photorealistic. Just amazing.